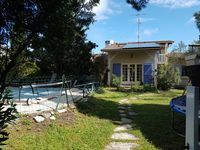 Property 1: Bay of Arcachon "La Douiria" quiet studio. Housing in a privileged setting close to shops. Property 11: Housing in a privileged setting close to shops. Villa Bassin d'Arcachon full foot 225 m2, 4 bedrooms and swimming pool. Property 25: Villa Bassin d'Arcachon full foot 225 m2, 4 bedrooms and swimming pool. Property 49: Arcachon center, studio direct access beach, exceptional sea view. Beautiful property and very welcoming! Stephane was superb and he couldn&rsquo;t do enough to help us and point us in the right direction. Lovely stay and would recommend this property!! It&rsquo;s finished beautifully and they have thought of everything!! Don&rsquo;t miss out and book today. Nice house, caring hosts, great location to explore this beautiful part of France!